There wasn't enough time in six minutes to drive home some very important points. In deciding which improvements to make, it is of the utmost importance for all stakeholders to agree on the metrics that will be used to determine the relative merits of various proposals. Until agreement is established on the scoring framework, debating the particular merits of this or that project is an arbitrary, subjective exercise with no reasonable chance of closure. You can read more about what I think are the metrics that matter. 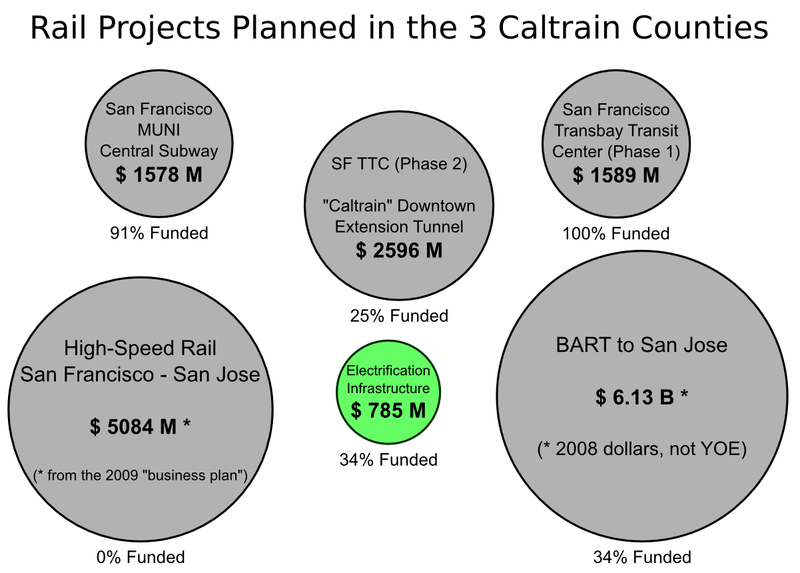 There are several reasons beyond poor marketing that explain why the Caltrain electrification project has been in the works forever, and threatens to continue to languish in that perpetual state of indecision--despite its very high return on investment. None of the reasons are technical. It's all politics. Electrification will not create many local jobs because it is a systems contract that contains primarily highly manufactured goods. Electrification does not involve the pouring of enormous amounts of concrete, so the local transportation-industrial complex (aligned around large civil engineering and construction firms) is not inclined to support it. Electrification would undermine the justification for BART on the peninsula. The federal funding for new transit mega-projects is scored in part on the basis of cost per new rider, and allowing Caltrain to tap those new riders would make BART look far less attractive an investment. Electrification is considered by many anti-HSR activists to be the camel's nose under the tent. It potentially hastens the day when high-speed trains will reach San Francisco. The mere threat of litigation has put the project on the back burner since last April. All these political obstacles must be overcome. DMUs (Diesel Multiple Units) were often mentioned at the summit as an alternative to electrification. This solution will not achieve the required time savings! Electric trains have a much higher power-to-weight ratio that gives them the required acceleration. It cannot be emphasized enough that the quality desired of Caltrain's new fleet is acceleration. Top speed matters much less. When picking a new train fleet, the key performance spec is power-to-weight ratio... today's diesels are at about 6 kW/metric ton, and we need to be at least in the 12-15 kW/ton range. A few people mentioned Japanese hybrid DMUs (diesel with battery storage), but those extremely lightweight DMUs would never meet the crash standards that are being required of Caltrain. If these hybrid trains were imported here, their structural mass would have to be increased and their acceleration would be insufficient to provide much of a benefit. If it can't do 12 kW/ton, forget about it. The mid-line overtake isn't half bad for offering continuing service to San Francisco Transbay, should the high-speed rail project initially terminate in San Jose. Some people asked about the doctored BART EMU photo. 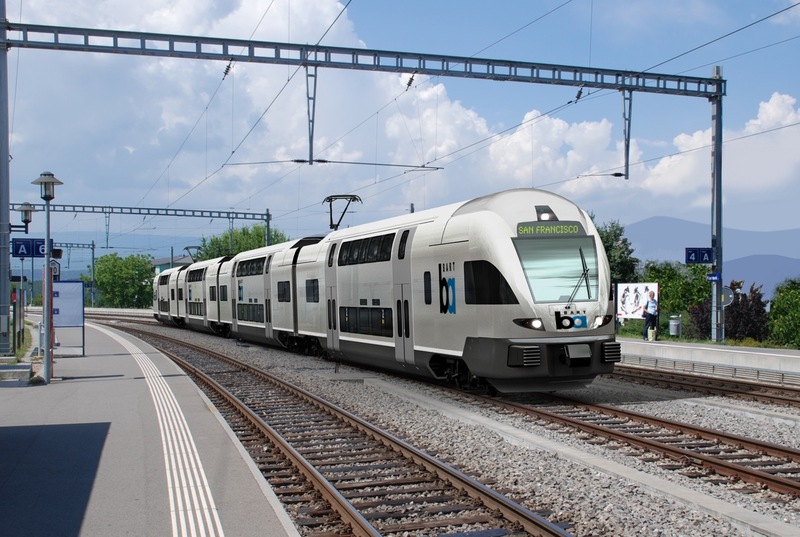 It is based on a Stadler KISS EMU (an off-the-shelf European design) that would be perfect for the peninsula. Here is the big version of the rendering. There was no time for questions, so please post any queries in the comment section below.